Some Thoughts on Landing an Airplane! by Larry Baum – EHFC Members Talking! I was TERRIBLE at landings. Not just bad – TERRIBLE. I either stalled the plane at 3-5ft (or more) or drove it into the runway. My airspeed control was marginal. My sight picture was non-existent. I was always in a hurry to land. I had no patience. Crosswinds were a total mystery to me. The plane was flying me, not the other way around. I went through three different instructors (including Mike Newman) as well as Jerry Friedman to try and figure it out. Nothing was working. I was ready to solo, but I wouldn’t get signed off, because I couldn’t land. I owned 1/3 of a Piper Tri-Pacer and really thought I might never learn to land and actually considered the necessity of having to sell it. To my complete amazement, the next landing I made was fine. So was the next one, and the next one. Some were better than others. But all were safe. It all came together day on Runway 32 that grey spring day. 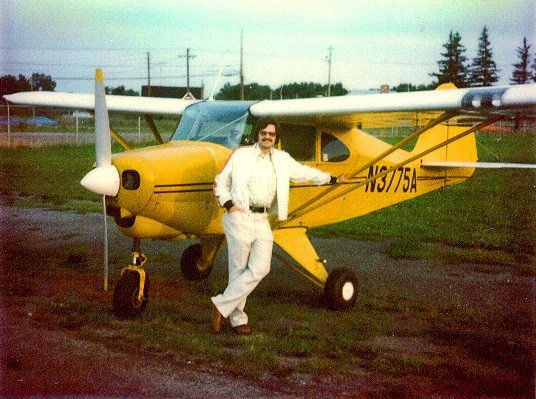 A week later I soloed. I can’t describe everything I do when landing, but there’s a picture in my head of what an airplane looks like when it touches down. It doesn’t matter if it’s a Tri-Pacer, Skyhawk, Mooney or Aerostar. The touchdown picture is the same. Oh there are type differences and nuances. Mooneys need to be “really” slow or will float forever. Tri-Pacers have a really short wing and need to be quite close to the runway before flaring. I tend to land the Aerostar a bit flat and fast. But in every situation, the thoughts of 1975 always come flooding back – Fly the airplane. Don’t let the airplane fly you. Do whatever you have to do to put the airplane into that landing attitude over the centerline and aligned just before touchdown…you can always go around! – Landings are the culmination of every hand-eye skill ever learned in flying (except possibly aerobatics). – EVERYONE, airline pilots included, have had landings they’d like back. For those of us that fly the airlines a lot, there are certainly “stinkers” more often than many would like to admit. And this is happens with pilots who do several landings “EVERY DAY”. – Landings can be fun. Landings can be challenging. – The centerline is your friend. Always land on it. – There is only three ways to get good and stay good at landings. Practice, practice & more practice. o Go up with instructors on good days, bad days, blustery days, rainy days. o With your instructor, go looking for crosswinds. If the wind is 320 in Ithaca, go to Cortland or Binghamton. o Learn to do spot landings. Pick the 1000ft marker. Practice till you can touchdown there every time. Then pick another spot – the numbers or 2000ft marker. Pick a different runway. You’d be surprised how different making changes can be. – If David, Mike or one of the other CFIs asks you about your landings, be candid with them. Are you totally comfortable with every landing and situation? Do you find yourself thinking about something that happened on the approach rather than what’s in front of you? Are you letting the plane fly you? – Fly with others who are good at landings. Ask them questions about their landing techniques…what works, what are they looking at, how they deal with crosswinds, etc. I’ve learned a lot about landing by flying with others. – Think about your last landing (or more). What went well and what could have been done better. In the Navy, every carrier landing is scored. Consider scoring your own landings. – Ask about what you don’t know or aren’t sure of. There are no stupid questions, just people who are too proud to ask them. – You are only as good as your next landing. Be humble. Wanna Get Away? How About Martha’s Vineyard? East Hill is AOPA “Pathfinder” Please Take Survey: What Works?